As these titles suggest, Fleischman's poetry collections are designed to be read aloud by more than one person. Hughes and Snively, with some assistance from several other performers, rise to the occasion, giving Fleischman's words the cheerful musicality the author intended. Throughout these readings, voices join in harmony, reading the same passage simultaneously, echoing each other, or answering one another in a playful dialogue style. The result is verse that has an appealing theatrical quality. Humor and information abound in Fleischman's writing as well. 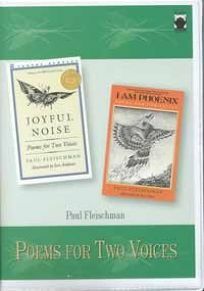 Listeners learn about the behavior and natural sounds of insects (Joyful Noise) and birds (I Am Phoenix) with rhythms and fun-to-say adjectives. From the ""whirling, twirling and gyrating"" of whirligig beetles and the vibrant ""humming, buzzing and droning"" of cicadas to the rhythmic chanting of whippoorwills and the whispering, nighttime voices of owls, the cast skillfully energizes Fleischman's work. Listeners of all ages will likely be eager to try their own Fleischman read-alouds. All ages. (Jan.) FYI: Joyful Noise won the 1989 Newbery Medal.